Szechenyi Baths is open in winter months, making the thermal bath and pools one of the major attractions and winter things to do in Budapest, Hungary. Not only the indoor, but also the outdoor pools are open in winter. The naturally hot (HOT!) spring waters – coming from deep underground the City Park Budapest – are simply not cooled down as in summer time, to keep bathing guests warm and cozy under the thick steam cushion hanging over the hot baths. It is a unique and unforgettable experience to hide from the cold winter weather in the relaxing thermal pools in Szechenyi Bath, the largest bath of Budapest, chosen to be one of the Top 8 Thermal Baths in the World by Huffington Post. Bath Parties in Szechenyi Baths are one of the best parties in Europe! 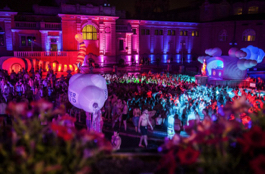 Including the pre NY Party in Szechenyi Baths, a highlight of Budapest at the end of December. 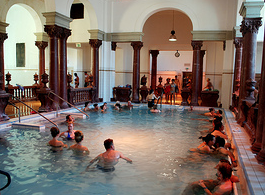 The rest of the winter Sparty series are held in the thermal pools of Lukacs Baths. 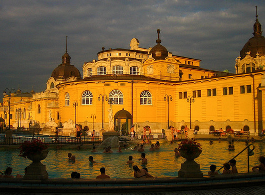 And let us recommend one more thing to do in one of the Budapest thermal baths, which also belongs to the family of Budapest Gyogyfurdok. The Saturday night bath parties in Szechenyi Bath are extended with winter bath parties, but this time not in Szechenyi Furdo itself, instead, in a lesser known but nice thermal bath of Budapest: the recently restored Lukacs Bath. Learn more about the winter bath parties here: Magic Bath Parties in Winter. Take a virtual tour in Szechenyi Bath Budapest to see the fantastic bath facilities in the Neo Baroque palace of Szechenyi Furdo. 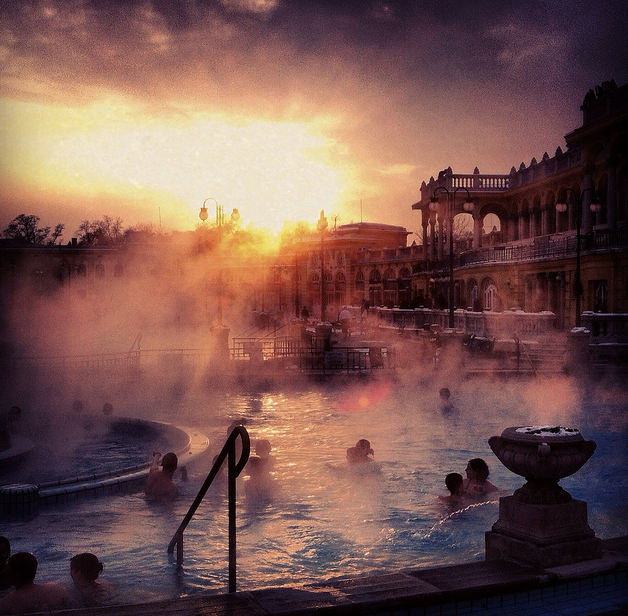 Valentine’s Day in Szechenyi Baths is a nice and romantic thing to do off the beaten path. Couples usually enjoy the later opening hours of the thermal bath (open until 10 pm), when most guests dive into the culinary life of Budapest or Budapest nightlife with its clubs, bars, pubs, night tours and night Danube cruises. Get some champagne and chill out, oh no, warm up in Szechenyi Bath to experience a unique Valentine’s Day evening in Budapest, Hungary. If you want to add a massage treatment at Szechenyi Bath for the two of you (massage therapies for couples are also available), book in advance. 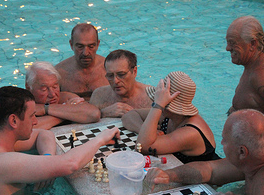 February 14 is an increasingly popular day in Szechenyi Furdo. Next Can I Rent a Bath Robe in Szechenyi Bath? At the moment, booking is possible until 4 January, as the enw prices will be introduced then. Booking for after 4 January will become possible in December. Thank you for your patience. We are coming from Australia and so need to schedule and book as far in advance as we can. We wish to purchase a day pass and private cabin for 8 January 2019. I see that the calendar only extends to 4 January at this time. At what date will we be able to book the 8 January, paying Euros. I’m afraid dates after Jan 4, 2019 will only be bookable after Jan 4. Thank you for your understanding. I am traveling with my friend to Budapest and was wondering if all the services on your website are available on December 23rd. I would really appreciate your help. 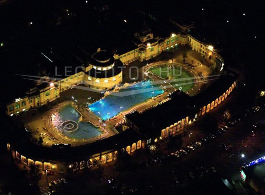 yes, Szechenyi Baths will be open as usual on Dec 23, and all services are available. you have already confirmed the receipt of the confirmation email. From 27 December, the opening hours are normal, between 6am and 10pm. 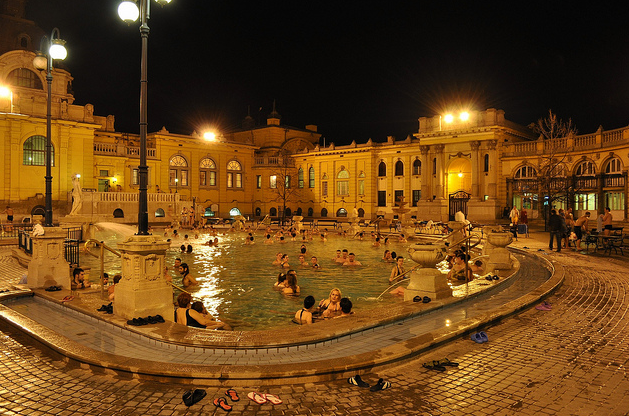 December 31 opening hours: Szechenyi Bath is open from 6 am to 6 pm on Dec 31. Check-in for online reservations: 9 am – 5 pm.